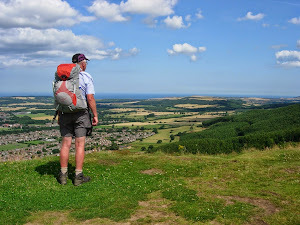 When I declared in the first post of this blog that Bryn and I were going to walk part of the The Cleveland Way, I also declared that fitness was an issue. Furthermore, that I aimed to reduce my weight and improve my fitness and stamina. I feel that I have made significant progress with part of that aim; I have reduced my weight by a stone. That's 14lbs off the targetted 20lbs reduction before we set off on our walk in August. I have shed the 14lbs over 7 weeks by eating less and exercising more. Exercise so far has consisted of walking rather than driving to work most days (it's almost a 5 mile return trip), occasional slightly longer walks with my dog and some bicycle rides of 5-10 miles. Exercise gets bumped up this week though as I move into Phase 2! My gym membership has been reactivated and I have been swimming. I'm not a strong/fast swimmer - it's more a case of moving whilst floating, and that movement doesn't come easily. It's takes maximum effort. It doesn't look pretty but those in the pool at the same time should take comfort from the fact that I do not displace as much water as I used to though. I start the gym workouts followed by swims this Wednesday and Friday and thereafter twice a week. I plan to ride my bicycle further and more often too. There has been progess this week on another front as well. I reached the ripe old age of 63.